ALDRIDGE, Civilian, ARNOLD, Civilian War Dead. 17 April 1941. Age 33. Fireman, A.F.S. Son of Martin Aldridge, of 30 Leigh Street, Attercliffe, Sheffield; husband of Elizabeth Aldridge, of 76 Ashley Road, South Shields, Co. Durham. Injured 10 April 1941, at Tyne Dock; died at Gateshead Emergency Hospital, Stannington. HERKESS, Civilian, HENRY ERNEST, Civilian War Dead. 5 October 1941. Age 72. Husband of Susannah Hunter Herkess, of Lynwood, Harton Lane, South Shields. Injured 2 October 1941, at South Shields; died at Rilton House Emergency Hospital. FINLAY, Civilian, SIDNEY, Civilian War Dead. 7 January 1941. Age 28. Son of A. and E. Finlay, of 45 St. Vincent Street, South Shields, Co. Durham. Died at 108 Eastcotes. LOGAN, Civilian, JAMES FREDERICK CLEMENT, Civilian War Dead. 22 October 1940. Age 32. of 30 Maycock Road. Son of Mary H. Logan, of 2 Cuthbert Avenue, Horsley Hill Estate, South Shields, Co. Durham, and of the late James Logan. Injured 20 October 1940, at Burbridge Timber Yard, Vecqueray Street; died at Coventry and Warwickshire Hospital. WILSON, Civilian, WINIFRED MENMUIR, Civilian War Dead. 19 February 1944. Age 45. of 45 Northcote Avenue. Daughter of Mr. and Mrs. James Woodcock, of South Avenue, Harton, South Shields; wife of Henry Ernest Wilson. Injured at Northcote Avenue; died same day at King Edward Hospital. DICKINSON, Civilian, LILY, Civilian War Dead. 18 October 1943. Age 45. of 42 Scotland Green Road, Ponders End. Daughter of the late Mr. and Mrs. Brock, of South Shields, Co. Durham; wife of Charles William Dickinson. Died at 42 Scotland Green Road. PETERS, Civilian, JOHN, Civilian War Dead. 16 September 1940. Age 25. of 33 Abdale Road. Son of John and Margaret Peters, of 17 South Frederick Street, South Shields, Co. Durham. Died at 256 Uxbridge Road. JOHNSON, Civilian, AMY, Civilian War Dead. 12 December 1942. Age 43. of 73 Union Road. Daughter of Polly Calvert, of 29 Stevenson Street, South Shields, and of the late George Calvert; wife of William Johnson. Died at 73 Union Road. SMITH, Civilian, CORA JOSEPHINE MARY, Civilian War Dead. 9 September 1940. Age 36. of 9 Cromwell Road. Daughter of Dr. R. Mills Hall, of South Shields, Durham, and of Alice Eleanor Hall, of Woodway, Carbone Hill Cuffley, Hertfordshire; wife of Sqdn. Ldr. Harold John E. Smith, M.B.E., R.A.F. Died at 9 Cromwell Road. COLMAN, Civilian, MARGARET REAY, Civilian War Dead. 28 August 1940. Age 58. of Brackley, Reedman Road, Long Eaton. Daughter of Thomas Alderson, of The Lawe, South Shields, Co. Durham; widow of John Robert Colman. Died at 23 Reedman Road. HARRISON, Civilian, JESSIE, Civilian War Dead. 1 July 1940 - 31 July 1940. Age 26. of 285 Mortimer Road, South Shields, Co. Durham. Daughter of Robert Harrison, and of Sarah Harrison. Died at 10 High Street. HARRISON, Civilian, SARAH, Civilian War Dead. 21 July 1940. Age 55. of 285 Mortimer Road, South Shields, Co. Durham. Wife of Robert Harrison. Died at 10 High Street. CHARLTON, Civilian, ALEXANDER ANDERSON, Civilian War Dead. 30 May 1943. Age 63. of 72 Stainton Street, South Shields. Son of the late Peter and Isabella Charlton. Injured 24 May 1943, at Stainton Street; died at General Hospital. MORALEE, Civilian, LOUISA, Civilian War Dead. 4 October 1941. Age 55. Wife of James Moralee, of 58 Chichester Road, South Shields, Co. Durham. Injured 30 September 1941, at Chichester Road; died at General Hospital. DE REDDER, Civilian, SIDNEY, Civilian War Dead. 2 October 1940. Age 44. A.C.A. ; of 9 Kilburn High Road. Son of Matthew de Redder, of 132 Baring Street, South Shields, Co. Durham, and of the late Dorothy Anne de Redder; husband of Lilian de Redder. Injured 26 September 1940, at Queen's Arms Hotel, Kilburn High Road; died at Paddington Hospital. RIDLEY, Civilian, ALICE OGILVIE, Civilian War Dead. 16 October 1940. Age 31. of 11 Barrie Street. Daughter of Joseph Ridley, of 129 Dale Street, South Shields, Co. Durham, and of the late Mary L. Ridley. Died at 16 Barrie Street. RIDLEY, Civilian, MARY LIZZIE, Civilian War Dead. 16 October 1940. Age 37. of 11 Barrie Street. Daughter of Joseph Ridley, of 129 Dale Street, South Shields, Co. Durham, and of the late Mary L. Ridley. Died at 16 Barrie Street. WOOD, Civilian, JOHN WILLIAM, Civilian War Dead. 27 April 1944. Age 42. Firewatcher; of 48 Montague Road, North End. Son of the late Charles Edwin Wood, and Mary Murray Wood, of 94 Stanhope Road, South Shields, Co. Durham; husband of Rose May Wood. Died at Commercial Road. ALI, Civilian, FAZIL, Civilian War Dead. 30 September 1941. Age 45. of 25 Market Place. Husband of Mary Ali. Died at 25 Market Place. ALI, Civilian, MARY, Civilian War Dead. 30 September 1941. Age 47. of 25 Market Place. Wife of Fazil Ali. Died at 25 Market Place. ALLISON, Civilian, WILLIAM, Civilian War Dead. 2 October 1941. Age 24. of 10 St. Hilda Terrace. Son of Mary Allison, and of the late William Allison. Died at Market Place. ARMSTRONG, Civilian, GEORGE THOMAS, Civilian War Dead. 2 October 1941. Age 64. of 17 Pollard Street. Husband of Mary Armstrong. Died at 17 Pollard Street. ARMSTRONG, Civilian, JANE ELIZABETH, Civilian War Dead. 2 October 1941. Age 35. of 17 Pollard Street. Daughter of Mary Armstrong, and of George Thomas Armstrong. Died at 17 Pollard Street. ARMSTRONG, Civilian, JOSEPH SPROAT, Civilian War Dead. 24 May 1943. Age 48. Constable, Borough Police; of 4 Lisle Road. Died at Regent Garage. BAILLIE, Civilian, ROBERT, Civilian War Dead. 24 May 1943. Age 42. Seaman, Merchant Navy; of 14 Dean Road. Son of James Baillie, of 32 King Street, Nairn, Morayshire, Scotland, and of the late Elsie Baillie. Died at Regent Garage. BAINBRIDGE, Civilian, LUCY, Civilian War Dead. 10 April 1941. Age 21. of 3 Palatine Street. Wife of George Filner Robson Bainbridge. Died at 127 Mile End Road. BAINES, Civilian, ALICE MAUD, Civilian War Dead. 2 October 1941. Age 52. of 242 South Eldon Street. Wife of Robert Baines. Died at South Eldon Street. BAKER, Civilian, ARNOLD, Civilian War Dead. 7 April 1941. Age 28. Firewatcher. Son of Thomas and Elizabeth Ann Baker, of Thorcroft, Newcastle Road; husband of Freda Baker, of 11 Fenwick Avenue. Injured at Tyne Dock; died same day at Ingham Infirmary. BALDRY, Civilian, WILLIAM GEORGE, Civilian War Dead. 2 October 1941. Age 68. Senior Air Raid Warden; of 32 Charlotte Street. Died at Market Place. BELL, Civilian, WILLIAM DALTON, Civilian War Dead. 24 May 1943. Age 36. A.R.P. Rescue Service. Son of Mr. and Mrs. Bell, of 166 Laygate Lane; husband of Florence Evelyn Bell, of 115 Imeary Street. Died at Moffat Street. BENHAM, Civilian, MARGARET, Civilian War Dead. 7 June 1943. Age 64. of 125 Marsden Street. Wife of Emmanuel Benham. Injured 24 May 1943, at 125 Marsden Street; died at Ingham Infirmary. BERRY, Civilian, ANDREW, Civilian War Dead. 10 April 1941. Age 42. of 127 Mile End Road. Husband of Rose Ann Berry. Died at 127 Mile End Road. BERRY, Civilian, ROSE ANN, Civilian War Dead. 10 April 1941. Age 43. of 127 Mile End Road. Wife of Andrew Berry. Died at 127 Mile End Road. BERTRAM, Civilian, GEORGE SAMUEL, Civilian War Dead. 24 May 1943. Age 49. Air Raid Warden. Son of Andrew and Eliza Bertram, of 40 Marsden Street. Died at Regent Garage. BLACK, Civilian, WILLIAM, Civilian War Dead. 30 September 1941. Age 17. Seaman, Merchant Navy; of 25 Market Place. Died at 25 Market Place. BOHILL, Civilian, ROBERT, Civilian War Dead. 3 October 1941. Age 28. Son of Henry and Jane Elizabeth Bohill, of 28 Park Avenue, Cleadon Estate. Injured 2 October 1941, at Tyne Dock; died at General Hospital. BOWSFIELD, Civilian, ESTHER JANE BOOTLE, Civilian War Dead. 2 October 1941. Age 50. Wife of Robert Stanley Bowsfield, of 123 Elizabeth Street. Died at 11 Isabella Street. BROOMHEAD, Civilian, WILLIAM EDWARD, Civilian War Dead. 2 October 1941. Age 19. N.F.S. Messenger. Son of Violet Cooper Lyon (formerly Broomhead), of 45 Roman Road, and of the late Thomas Edward Broomhead. Died at Market Place. BROWN, Civilian, ISABELLA, Civilian War Dead. 25 May 1943. Age 16. Daughter of Joseph Brown, of 70 Stevenson Street. Injured 24 May 1943, on way to shelter; died at Ingham Infirmary. BURDON, Civilian, ELIZABETH, Civilian War Dead. 2 October 1941. Age 61. of 77 Livingstone Street. Wife of Matthew Burdon. Died at Market Place. BURN, Civilian, ANNIE, Civilian War Dead. 30 September 1941. Age 41. of 135 Morton Street. Daughter of the late Charles Henry and Annie Graham; wife of George Burn. Died at 128 Morton Street. BURN, Civilian, GEORGE, Civilian War Dead. 30 September 1941. Age 41. of 135 Morton Street. Husband of Annie Burn. Died at 128 Morton Street. BURN, Civilian, ISABELLA DOBSON, Civilian War Dead. 10 April 1941. Age 37. of 24 Harper Street. Wife of S. Burn. Died at 24 Harper Street. BURN, Civilian, JOHN, Civilian War Dead. 10 April 1941. Age 16. of 24 Harper Street. Son of S. Burn, and of Isabella Dobson Burn. Died at 24 Harper Street. BYRNE, Civilian, MARGARET, Civilian War Dead. 22 February 1941. Age 47. of 29 Broderick Street. Wife of Thomas Byrne. Injured 15 February 1941, at 29 Broderick Street; died at Ingham Infirmary. CAMPBELL, Civilian, JOHN, Civilian War Dead. 10 April 1941. Age 74. of 134 Mile End Road. Husband of the late Margaret Jane Campbell. Died at 134 Mile End Road. CARDNO, Civilian, STANLEY, Civilian War Dead. 24 May 1943. Age 11. of 38 Marsden Street. Son of Henry F. M. Cardno. Died at 123 Marsden Street. CARNEY, Civilian, JOSEPH, Civilian War Dead. 2 October 1941. Age 42. of 9 Queen Street. Died at Queen Street. CARRINGTON, Civilian, ADA SARAH, Civilian War Dead. 2 October 1941. Age 76. Daughter of William Carrington. Died at 6 Broughton Road. CHARLTON, Civilian, ALICE, Civilian War Dead. 10 April 1941. Age 58. of 123 Mile End Road. Died at 123 Mile End Road. CHARLTON, Civilian, MARY ANN, Civilian War Dead. 2 October 1941. Age 67. of 170 Lytton Street. Widow of Robert Charlton. Died at Zion Hall, Laygate. COLLINS, Civilian, SIDNEY REGINALD HENRY, Civilian War Dead. 1 January 1943. Age 55. Firewatcher. Husband of Frances Kate Collins, of 5 8 Eastfield Avenue, West Monkseaton, Northumberland. Died at Tyne Dock. COOK, Civilian, FRANCIS RIDDLE, Civilian War Dead. 24 May 1943. Age 68. of 108 Marsden Street. Husband of Alice T. Cook. Died at Marsden Street. COOKE, Civilian, JOSEPH RIDDLE, Civilian War Dead. 24 May 1943. Age 45. Home Guard; Firewatcher; of 6 Moffat Street. Son of Mr. and Mrs. E. Cooke, of 4 John Street, Whitburn; husband of Margaret Cooke. Died at Stevenson Street. COOKE, Civilian, RONALD RIDDLE, Civilian War Dead. 24 May 1943. Age 20. Home Guard; of 6 Moffat Street. Son of Margaret Cooke, and of Joseph Riddle Cooke. Died at Stevenson Street. COULSON, Civilian, CHARLES, Civilian War Dead. 2 October 1941. Age 23. of 246 South Eldon Street. Died at South Eldon Street. COX, Civilian, JAMES WILLIAM, Civilian War Dead. 25 April 1941. Age 47. of 117 King George Road. Died at 117 King George Road. DAVIES, Civilian, MARION, Civilian War Dead. 2 October 1941. Age 9. of 172 Lytton Street. Daughter of William Davies, and of the late Elizabeth Davies. Died at 172 Lytton Street. DAY, Civilian, EDITH FLORENCE, Civilian War Dead. 2 October 1941. Age 49. of 44 Hyde Street. Daughter of John and Elizabeth Richardson Bailey, of 7 Miners Homes, Harton; wife of Thomas Day. Died at 44 Hyde Street. DAY, Civilian, THOMAS, Civilian War Dead. 3 October 1941. Age 58. of 44 Hyde Street. Son of the late Anthony and Jane Day, of 111 Hedley Street; husband of Edith Florence Day. Injured 2 October 1941, at 44 Hyde Street; died at Ingham Infirmary. DHOOLE, Civilian, MOHAMMED, Civilian War Dead. 30 September 1941. Age 42. of 72 Cuthbert Street. Died at 25 Market Place. DOBSON, Civilian, MARY HORNER, Civilian War Dead. 30 September 1941. Age 59. Firewatcher; of 85 Harton Lane. Daughter of the late William Dobson. Died at Birchdale, Ambleside Avenue. DOCKWRAY, Civilian, CATHERINE ANN, Civilian War Dead. 10 April 1941. Age 51. of 2 Fort Street. Wife of Ernest Dockwray. Died at 2 Fort Street. DOCKWRAY, Civilian, CATHERINE ANNIE, Civilian War Dead. 10 April 1941. Age 25. of 2 Fort Street. Daughter of Ernest and Catherine Ann Dockwray. Died at 2 Fort Street. DOCKWRAY, Civilian, ERNEST, Civilian War Dead. 10 April 1941. Age 51. of 2 Fort Street. Husband of Catherine Ann Dockwray. Died at 2 Fort Street. DOCKWRAY, Civilian, MARY JANE, Civilian War Dead. 10 April 1941. Age 22. of 2 Fort Street. Daughter of Ernest and Catherine Ann Dockwray. Died at 2 Fort Street. EFFARD, Civilian, ETHEL MAY, Civilian War Dead. 2 October 1941. Age 45. of 40 Hyde Street. Wife of William Effard. Died at 40 Hyde Street. ELLIOTT, Civilian, ELLEN, Civilian War Dead. 2 October 1941. Age 43. of 240 South Eldon Street. Wife of William Elliott. Died at South Eldon Street. ELLIOTT, Civilian, IRENE, Civilian War Dead. 2 October 1941. Age 11. of 240 South Eldon Street. Daughter of William Elliott, and of Ellen Elliott. Died at South Eldon Street. ELLIOTT, Civilian, JOYCE, Civilian War Dead. 2 October 1941. Age 8. of 240 South Eldon Street. Daughter of William Elliott, and of Ellen Elliott. Died at South Eldon Street. ELLIOTT, Civilian, WALTER, Civilian War Dead. 30 September 1941. Age 69. of 29 George Potts Street. Husband of Isabella Elliott. Died at 29 George Potts Street. ELLIOTT, Civilian, WILLIAM, Civilian War Dead. 2 October 1941. Age 18. Home Guard; of 240 South Eldon Street. Son of William Elliott, and of Ellen Elliott. Died at South Eldon Street. ELLIOTT, Civilian, WILLIAM JAMES, Civilian War Dead. 2 October 1941. Age 62. of Open Air School House, Ceadon. Husband of Elizabeth Elliott. Died at Market Place. EVERS, Civilian, JOHN, Civilian War Dead. 11 October 1942. Age 78. of 14 Mayfair Gardens. Son of Henry Evers, of Newcastle-upon-Tyne, Northumberland. Died at 14 Mayfair Gardens. FINDLAY, Civilian, JAMES, Civilian War Dead. 24 May 1943. Age 64. of 96 Marsden Street. Husband of M. Findlay. Died at Stainton Street. FORREST, Civilian, WILLIAM, Civilian War Dead. 12 March 1943. Age 19. Home Guard. Son of William Train Forrest and Jessie Forrest, of 4 Buttermere Gardens, Harton. Died at 64 Cauldwell Villas. FOTHERGILL, Civilian, JOHN, Civilian War Dead. 2 October 1941. Age 55. Firewatcher. Husband of Jane Fothergill, of 117 Elizabeth Street. Died at Ingham Infirmary. GARTHWAITE, Civilian, FRANCES, Civilian War Dead. 3 October 1941. Age 14. of 244 South Eldon Street. Daughter of Fred and Frances Garthwaite. Injured 2 October 1941, at South Eldon Street; died at General Hospital. GARTHWAITE, Civilian, THOMAS NEWLY, Civilian War Dead. 3 October 1941. Age 13. of 244 South Eldon Street. Son of Fred and Frances Garthwaite. Injured 2 October 1941, at South Eldon Street; died at General Hospital. GIBB, Civilian, JANE CLARA, Civilian War Dead. 3 October 1941. Age 82. of 11 Anderson Street. Widow of Robert Gibb. Injured 2 October 1941, at 11 Anderson Street; died at General Hospital. GOMEZ, Civilian, BARBARA, Civilian War Dead. 2 October 1941. Age 20. Wife of Domingo Gomez, of 114 Gordon Street, Camelon, Falkirk, Scotland. Died at 25 Market Place. GRAHAM, Civilian, CHARLES DOUGLAS, Civilian War Dead. 2 October 1941. Age 49. Firewatcher. Son of William Graham, of 24 Eastbourne Grove, and of the late Hannah Graham. Died at Market Place. GRAHAM, Civilian, JOHN CHARLES, Civilian War Dead. 30 September 1941. Age 9. of 128 Morton Street. Son of Charles Austin Graham and Mary Graham. Died at 128 Morton Street. GRAINGER, Civilian, EDITH ELSTOB, Civilian War Dead. 24 May 1943. Age 40. of 2 Hepscott Terrace. Daughter of the late Mr. and Mrs. Elstob; wife of George Leslie Grainger. Died at 2 Hepscott Terrace. HADAWAY, Civilian, JOSEPH WILLIAM, Civilian War Dead. 24 May 1943. Age 58. of 20 Moffat Street. Died at 10 Moffat Street. HARCUS, Civilian, ROSE, Civilian War Dead. 10 April 1941. Age 18. of 127 Mile End Road. Daughter of Rose Ann Berry (formerly Harcus). Died at 127 Mile End Road. HART, Civilian, ELIZABETH, Civilian War Dead. 2 October 1941. Age 34. Wife of John Robert Frederick Hart, of 42 Bede Street. Died at Market Place. HATWELL, Civilian, LOTTIE HAROLDEAN, Civilian War Dead. 2 October 1941. Age 37. Daughter of J. W. Stobbs, of 22 Gordon Street; wife of Arthur Basil Hatwell, of the same address. Died at Marlborough Street. HENDERSON, Civilian, GEORGE, Civilian War Dead. 24 May 1943. Age 34. Home Guard; of 94 Marsden Street. Husband of Jane E. Henderson. Died at 94 Marsden Street. HENDERSON, Civilian, JOHN, Civilian War Dead. 30 September 1941. Age 31. Son of Annie Henderson, of 12 Frater Terrace, East Howdon-on-Tyne, Northumberland, and of the late R. Henry Henderson. Died at Ferry Landing. HESLOP, Civilian, RUTH, Civilian War Dead. 2 October 1941. Age 20. Daughter of Robert Heslop, of 117 Stoddart Street, Tyne Dock. Died at 8 Market Place. HOLLEY, Civilian, WILLIAM, Civilian War Dead. 25 August 1940. Age 71. of 241 H. S. Edwards Street. Son of Thomas and Eleanor Holley, of 11 Maxwell Street. Died at Dennet's Stables, Readhead Street. HORNBY, Civilian, JAMES, Civilian War Dead. 4 October 1941. Age 39. Husband of Lilian Hornby, of 51 Lord Nelson Street, Tyne Dock. Injured 2 October 1941, at Market Place; died at Ingham Infirmary. HOWARD, Civilian, SARAH, Civilian War Dead. 11 July 1940. Age 62. of 36 Princess Street, Jarrow. Widow of William J. Howard. Injured 2 July 1940, at 36 Princess Street; died at General Hospital. HOWARD, Civilian, WILLIAM JOHN, Civilian War Dead Link. see JARROW list. HOWCROFT, Civilian, MAY, Civilian War Dead. 10 April 1941. Age 43. of 129 Mile End Road. Widow of S. Howcroft. Died at 129 Mile End Road. JOHNSON, Civilian, WILLIAM JASPER, Civilian War Dead. 30 September 1941. Age 70. of 37 George Potts Street. Died at 37 George Potts Street. JOPLING, Civilian, THOMASINA, Civilian War Dead. 13 November 1941. Age 87. of 63 Percy Street. Widow of John Jopling. Injured 2 October 1941, at Percy Street; died at Ingham Infirmary. KENT, Civilian, LESLIE, Civilian War Dead. 2 October 1941. Age 29. Firewatcher; of 369 South Taylor Street. Son of Mrs. Kent, of 12 Poplar Grove, Cleadon, and of the late G. Kent; husband of Jane Kent. Died at South Taylor Street. KOCH, Civilian, MARY DOROTHY, Civilian War Dead. 1 October 1941. Age 70. of 225 H.S. Edwards Street. Widow of Ernest Koch. Died at 225 H.S. Edwards Street. LACEY, Civilian, LILLIAN, Civilian War Dead. 30 September 1941. Age 47. of 114 Harton Lane. Wife of William Lacey. Died at 114 Harton Lane. LAING, Civilian, JEANETTE, Civilian War Dead. 10 April 1941. Age 5. of 131 Mile End Road. Daughter of the late Thomas William Laing. Died at 131 Mile End Road. LAMB, Civilian, LESLIE, Civilian War Dead. 16 February 1941. Age 23. Constable, Borough Police. Son of Edwin and Elizabeth Lamb, of 67 Hedgeley Road. Died at Beach Road. LEEDER, Civilian, ANNIE, Civilian War Dead. 2 October 1941. Aged 4 months. Daughter of Mr. and Mrs. Alfred Edward Leeder, of 25 H.S. Edwards Street. Died at 227 H.S. Edwards Street. LUTHER, Civilian, WALTER, Civilian War Dead. 2 October 1941. Age 2. of 47 Percy Street. Son of Harry and Jessie Luther. Died at Percy Street. LYNCH, Civilian, JOHN, Civilian War Dead. 2 October 1941. Age 64. Seaman, Merchant Navy; of 121 Taylor Street. Husband of the late Margaret Lynch. Died at Market Place. MACEY, Civilian, DAVID WILLIAM, Civilian War Dead. 24 May 1943. Age 25. Home Guard; of 117 Marsden Street. Husband of Jennie Macey. Died at 117 Marsden Street. MACK, Civilian, ADRIAN, Civilian War Dead. 25 April 1941. Age 6. of 119 King George Road. Son of Harry and Phoebe Mack. Died at 119 King George Road. MACK, Civilian, HARRY, Civilian War Dead. 25 April 1941. Age 28. of 119 King George Road. Husband of Phoebe Mack. Died at 119 King George Road. MACK, Civilian, PHOEBE, Civilian War Dead. 25 April 1941. Age 27. of 119 King George Road. Wife of Harry Mack. Died at 119 King George Road. MACKINTOSH, Civilian, GEORGE YARROW, Civilian War Dead. 30 September 1941. Age 65. S.J.A.B. Son of Charles and Mary Mackintosh, of George Street, Howdon-on-Tyne, Northumberland; husband of Christina Mackintosh, of 187 Mowbray Road. Died at Whitehill Point Ferry Landing. MANN, Civilian, JOHN, Civilian War Dead. 30 September 1941. Age 58. Husband of Isabella Bell Mann, of 75 Watling Street. Died at Whitehill Point Ferry Landing. McGREGOR, Civilian, GEORGE WILLIAM, Civilian War Dead. 14 September 1941. Age 41. Divisional Officer, N.F.S. Husband of Florence McGregor. Injured 31 August 1941, on S.S. Anglo Norse, Black Jetty Buoys, Jarrow; died at South Shields General Hospital. McLACKLAND, Civilian, WILLIAM, Civilian War Dead. 10 April 1941. Age 61. of 125 Mile End Road. Husband of Ellen McLackland. Died at 125 Mile End Road. MENSFORTH, Civilian, THOMAS WILLIAM, Civilian War Dead. 30 September 1941. Age 39. Husband of Christina Mensforth, of 89 South Palmerston Street. Died at Whitehill Point Ferry Landing. METCALFE, Civilian, CHARLOTTE, Civilian War Dead. 24 May 1943. Age 54. of 100 Marsden Street. Wife of Thomas James Metcalfe. Died at 100 Marsden Street. METCALFE, Civilian, STANLEY, Civilian War Dead. 24 May 1943. Age 14. of 100 Marsden Street. Son of Thomas James and Charlotte Metcalfe. Died at 100 Marsden Street. METCALFE, Civilian, THOMAS JAMES, Civilian War Dead. 24 May 1943. Age 63. of 100 Marsden Street. Husband of Carlotte Metcalfe. Died at 100 Marsden Street. MILLER, Civilian, WILLIAM BROWN, Civilian War Dead. 2 October 1941. Age 52. Firewatcher. Son of Dora Miller, of 36 Victoria Road, and of the late John Kenneth Miller; husband of Blanche Henriette Miller, of 61 Harton House Road. Died at Market Place. MILLINER, Civilian, SYDNEY, Civilian War Dead. 24 May 1943. Age 38. of 124 Marsden Street. Son of Mrs. S. Milliner, of 166 H.S. Edwards Street, and of the late S. Milliner; husband of Ada P. Milliner. Died at Marsden Street. MITCHELL, Civilian, CHARLOTTE MAUREEN, Civilian War Dead. 12 October 1942. Aged 11 months; of 260 Green Lane. Daughter of James and Esther Mitchell. Injured 11 October 1942, at 260 Green Lane; died at General Hospital. MOUTER, Civilian, REUBEN WARWICK, Civilian War Dead. 24 May 1943. Age 37. Husband of Wilhelmina Mary Mouter, of 50 Marsden Street. Died at Marsden Street. NELLIS, Civilian, THOMAS, Civilian War Dead. 24 May 1943. Age 49. of 92 Marsden Street. Husband of E. Nellis. Died at 92 Marsden Street. OGG, Civilian, ETHEL, Civilian War Dead. 25 April 1941. Age 30. of 119 King George Road. Wife of Thomas William Ogg. Died at 119 King George Road. OGG, Civilian, THOMAS WILLIAM, Civilian War Dead. 25 April 1941. Age 30. of 119 King George Road. Son of Alexander Ogg; husband of Ethel Ogg. Died at 119 King George Road. OLIPHANT, Civilian, DAVID, Civilian War Dead. 2 October 1941. Age 28. of 223 H.S. Edwards Street. Son of J. W. and M. H. Oliphant, of 74 Eglesfield Road; husband of Georgina Oliphant. Died at 223 H.S. Edwards Street. ORMONDE, Civilian, GEORGE THOMAS, Civilian War Dead. 26 April 1941. Age 56. of 98 Broderick Street. Injured at Meldon Terrace; died same day at General Hospital. PARK, Civilian, DAVID, Civilian War Dead. 2 October 1941. Age 11. of 42 Hyde Street. Son of Thomas William Park, and of the late Catherine Park. Died at 42 Hyde Street. PAUL, Civilian, WINIFRED CUNNINGHAM, Civilian War Dead Link. see HEBBURN list. PAUL, Civilian, WILLIAM JOHN, M M, Civilian War Dead. 12 October 1942. Age 48. of 8 Mill Lane, Hebburn. Husband of Winifred Cunningham Paul. Injured 11 October 1942, at 8 Mill Lane; died at General Hospital. PEARSON, Civilian, SARAH, Civilian War Dead. 10 April 1941. Age 54. of 14 Sheldon Street, Jarrow. Daughter of the late Thomas and Ellen Badger; wife of Dryden Pearson. Injured at Sheldon Street; died same day at General Hospital. PRIESTLEY, Civilian, MATTHEW, Civilian War Dead. 10 April 1941. Age 49. Fireman, A.F.S. Husband of Mary Priestley, of 119 Sunderland Road. Died at Readheads Shipyard. PRIOR, Civilian, CHRISTINA, Civilian War Dead. 10 April 1941. Age 67. of 17 Clyvendon Rise. Wife of Matthew Prior. in ambulance near Westoe. PRIOR, Civilian, MATTHEW, Civilian War Dead. 10 April 1941. Age 61. of 17 Clyvendon Rise. Husband of Christina Prior. in ambulance near Ridgeway. PRYDE, Civilian, JOHN, Civilian War Dead. 2 October 1941. Age 27. Merchant Navy; of 14 Cowgate Crescent, Tayport, Fife, Scotland. Husband of Elizabeth Pryde. Died at Queen Street. PURVIS, Civilian, ALBERT GEORGE, Civilian War Dead. 16 February 1941. Age 23. Leading Fireman, A.F.S. Son of Gilbert and Edith Alice Purvis, of 29 Vespasian Street; husband of Jane Ivy Purvis, of 23 Reay Street. Injured at Marine Park; died same day at Ingham Infirmary. RASMUSSEN, Civilian, HILMAR OLAUS, Civilian War Dead. 15 February 1941. Age 65. of 27 Broderick Street. Died at 27 Broderick Street. RASMUSSEN, Civilian, KATHLEEN MAUD, Civilian War Dead. 15 February 1941. Age 21. of 27 Broderick Street. Daughter of Hilmar Olaus Rasmussen. Died at 27 Boderick Street. RENTON, Civilian, FREDERICK, Civilian War Dead. 6 September 1943. Age 46. A.R.P. Rescue Service. Son of Clara Renton, of 17 Barehirst Street, and of the late Ralph Renton. Died at Marsden Street. RENWICK, Civilian, GEORGE LYALL WALTER, Civilian War Dead. 16 February 1941. Age 33. Fireman, A.F.S. ; of 101 Saville Street. Son of Josephine Whitfield (formerly Renwick), of 343 Sunderland Road; husband of Eva Renwick. Injured at Beech Road; died same day at Ingham Infirmary. RICHARDSON, Civilian, MATTHEW, Civilian War Dead. 24 May 1943. Age 22. Home Guard; of 207 Marsden Street. Son of Mrs. E. Richardson, of 37 West Walpole Street; husband of Lavinia Irene Richardson. Died at Marsden Street. RIDLEY, Civilian, ROBERT ALFRED, Civilian War Dead. 2 October 1941. Age 36. Seaman, Merchant Navy; of 32 Clayton Road, Newcastle-upon-Tyne, Northumberland. Son of the late Mr. and Mrs. R. A. Ridley. Died at 9 Market Place. ROBINSON, Civilian, WILLIAM GRAHAM, Civilian War Dead. 24 May 1943. Age 48. of 59 Wawn Street. Husband of J. Robinson. Died at 59 Wawn Street. ROBISON, Civilian, VIOLET, Civilian War Dead. 25 April 1941. Age 44. of 115 King George Road. Wife of J. Robison. Died at 115 King George Road. ROBSON, Civilian, ALAN, Civilian War Dead. 2 October 1941. Age 10. of 38 Hyde Street. Son of Edward McGregor Robson and Margaret Hutchison Robson. Died at 38 Hyde Street. ROBSON, Civilian, KENNETH, Civilian War Dead. 2 October 1941. Age 8. of 38 Hyde Street. Son of Edward McGregor Robson and Margaret Hutchison Robson. Died at 38 Hyde Street. ROBSON, Civilian, SARAH, Civilian War Dead. 2 October 1941. Age 19. Daughter of Elizabeth Robson, of 33 Eldon Street, and of the late William Robson. Died at Percy Street. ROLLO, Civilian, HILDA, Civilian War Dead. 2 October 1941. Age 37. of 221 H. S. Edwards Street. Wife of James Rollo. Died at 221 H. S. Edwards Street. ROWDEN, Civilian, EDNA MAY, Civilian War Dead. 2 October 1941. Age 30. of 42 Hyde Street. Daughter of Thomas William Park, and of the late Catherine Park; wife of Stanley Rowden. Died at 42 Hyde Street. ROWDEN, Civilian, STANLEY, Civilian War Dead. 2 October 1941. Age 31. Merchant Navy; of 42 Hyde Street. Son of Mary Jane Rowden, of 134 John Williamson Street; husband of Edna May Rowden. Died at 42 Hyde Street. SCOTT, Civilian, JAMES, Civilian War Dead. 22 October 1941. Age 51. Heavy Rescue Service. Husband of Mary Scott, of 10 Spencer Street, Hebburn. Injured 21 October 1941, at Council Yard, Glen Street, Hebburn; died at General Hospital. SCULLION, Civilian, ANNIE, Civilian War Dead Link. see JARROW list. SCULLION, Civilian, CATHERINE, Civilian War Dead. 2 July 1940. Age 3. of 34 Princess Street, Jarrow. Daughter of Henry and Annie Scullion. Injured at 34 Princess Street; died same day at General Hospital. SCULLION, Civilian, HENRY, Civilian War Dead Link. see JARROW list. SHIELD, Civilian, EDWARD, Civilian War Dead. 2 October 1941. Age 73. of 59 Winchester Street. Husband of Ida May Shield. Died at 59 Winchester Street. SLESSER, Civilian, JAMES OXEN NORRIE, Civilian War Dead. 24 May 1943. Age 30. Air Raid Warden Son of Alexander Slesser, of 161 H. S. Edwards Street. Died at Dean Road. SMITH, Civilian, ROBERT, Civilian War Dead. 14 March 1943. Age 67. of 74 Church Street, Boldon Colliery. Injured 12 March 1943, at 74 Church Street; died at General Hospital. STEPHENSON, Civilian, FREDERICK OLIVER, Civilian War Dead. 2 October 1941. Age 58. of 20 Queen Street. Son of the late George and Catherine Stephenson; husband of May Stephenson. Died at Queen Street. STEWART, Civilian, GLADYS MAY, Civilian War Dead. 2 October 1941. Age 19. Daughter of Mr. and Mrs. Robert Stewart, of 1 Station Cottages, Tyne Dock. Died at Market Place. STRAUGHAN, Civilian, PRISCILLA, Civilian War Dead. 2 October 1941. Age 65. of 28 Hyde Street. Wife of Robert Straughan. Died at 28 Hyde Street. STRAUGHAN, Civilian, ROBERT, Civilian War Dead. 2 October 1941. Age 63. of 28 Hyde Street. Husband of Priscilla Straughan. Died at 28 Hyde Street. SUTTON, Civilian, STANLEY, Civilian War Dead. 24 May 1943. Age 40. Deputy Head Warden. Husband of Margaret Sutton, of 123 Marlborough Street. Died at Regent Garage. SWIFT, Civilian, HENRY BOWMAN, Civilian War Dead. 24 May 1943. Age 16. of 98 Marsden Street. Son of Martha Swift, and of the late William Henry Swift. Died at 98 Marsden Street. SYMONDS, Civilian, WILLIAM, Civilian War Dead. 2 October 1941. Age 37. Son of Elizabeth Symonds, of 92 Queen's Road, Jarrow. Died at Eldon Street. TAWS, Civilian, CLARA, Civilian War Dead. 10 April 1941. Age 40. of 22 Harper Street. Wife of Stanley Taws. Died at 22 Harper Street. TAWS, Civilian, CLARA, Civilian War Dead. 11 April 1941. Age 18. of 22 Harper Street. Daughter of Stanley Taws, and of Clara Taws. Injured 10 April 1941, at 22 Harper Street; died at Ingham Infirmary. TAWS, Civilian, JOHN, Civilian War Dead. 10 April 1941. Age 2. of 22 Harper Street. Son of Stanley Taws, and of Clara Taws. Died at 22 Harper Street. TEASDALE, Civilian, JESSIE CHRISTIE, Civilian War Dead. 30 September 1941. Age 30. of 3 Cauldwell Place. Daughter of Alexander Nicol Keillar and Isabella Keillar, of 23 Belle Vue Terrace, Willington; wife of A.C.1 Robert Huntley Teasdale, R.A.F. Died at 4 Ambleside Avenue. THOBURN, Civilian, RALPH COOPER, Civilian War Dead. 10 April 1941. Age 34. Fireman, Sunderland A.F.S. Husband of Florence May Thoburn, of 24 Wear Street, Hendon, Sunderland. Died at South Shields Docks. THOMPSON, Civilian, GLADYS, Civilian War Dead. 2 October 1941. Aged 6 months; of 11 Isabella Street. Daughter of George William Waters Thompson and Vera M. Thompson. Died at 11 Isabella Street. THOMPSON, Civilian, HILDA, Civilian War Dead. 30 September 1941. Age 53. Air Raid Warden; of 7 Southfield Road. Wife of John G. Thompson. Died at Eastfield Road. TYLER, Civilian, ELIZABETH, Civilian War Dead Link. see JARROW list. TYLER, Civilian, SAMUEL, Civilian War Dead. 10 April 1941. Age 70. of 24 Sheldon Street, Jarrow. Husband of Elizabeth Tyler. Injured at 24 Sheldon Street; died same day at General Hospital. WALKER, Civilian, DOUGLAS, Civilian War Dead. 2 October 1941. Age 9. of 20 Anderson Street. Son of William Thomas Henry and Martha May Walker. Died at 20 Anderson Street. WALKER, Civilian, GEORGE KENNETH, Civilian War Dead. 2 October 1941. Age 16. of 20 Anderson Street. Son of William Thomas Henry and Martha May Walker. Died at 20 Anderson Street. WALKER, Civilian, MARTHA MAY, Civilian War Dead. 2 October 1941. Age 52. of 20 Anderson Street. Wife of William Thomas Henry Walker. Died at 20 Anderson Street. WALKER, Civilian, WILLIAM THOMAS HENRY, Civilian War Dead. 2 October 1941. Age 5. of 20 Anderson Street. Husband of Martha May Walker. Died at 20 Anderson Street. WALTON, Civilian, MARGARET ANN, Civilian War Dead. 6 October 1941. Age 69. of 31 George Potts Street. Widow of William Walton. Injured 30 September 1941, at 31 George Potts Street; died at General Hospital. WAPLING, Civilian, MARGARET, Civilian War Dead. 19 October 1941. Age 69. of 78 Porchester Street. Wife of William Wapling. Injured 2 October 1941, at 78 Porchester Street; died at General Hospital. WATSON, Civilian, CHRISTOPHER, Civilian War Dead. 2 October 1941. Age 58. Special Constable; S.J.A.B. ; of 29 Albany Street. Son of Mary Ann Watson, of Winnipeg, Canada, and of the late John Watson; husband of Elizabeth Watson. Died at Oxford Street. WATSON, Civilian, ERNEST EDWARD, Civilian War Dead. 10 April 1941. Aged 17 months; of 18 Sheldon Street, Jarrow. Son of Ernest Israel Watson, and of Margaret Buckler Wtson. Injured at Sheldon Street; died same day at General Hospital. WATT, Civilian, GEORGE, Civilian War Dead. 2 October 1941. Age 21. Seaman, Merchant Navy. Son of Mr. and Mrs. George Watt, of 68 Straight Path, Gardenstown, Banffshire, Scotland. Died at Queen Street. WHARTON, Civilian, JOHN, Civilian War Dead. 16 February 1941. Age 36. Fireman, A.F.S. Son of John N. and Margaret E. Wharton, of 172 Fort Street; husband of Hannah Elizabeth Wharton, of 9 May Street. Injured at South Shields; died same day at Ingham Infirmary. WILSON, Civilian, JANE, Civilian War Dead. 10 April 1941. Age 67. of 1.5 Fort Street. Widow of J. Wilson. Died at corner of Fort Street. WILSON, Civilian, JOHN, Civilian War Dead. 10 April 1941. Age 42. of 1.5 Fort Street. Son of Jane and of the late J. Wilson. Died at Mile End Road. WINFIELD, Civilian, ANN, Civilian War Dead. 2 October 1941. Age 65. of 3 Wellington Terrace. Wife of Frederick James Atkin Winfield. Died at 10 Broughton Road. WINFIELD, Civilian, EVELYN EVANS, Civilian War Dead. 2 October 1941. Age 37. of 10 Broughton Road. Daughter of the late James Todd; wife of Joseph Arthur Winfield. Died at 10 Broughton Road. WINFIELD, Civilian, FREDERICK JAMES ATKIN, Civilian War Dead. 2 October 1941. Age 67. of 3 Wellington Terrace. Husband of Ann Winfield. Died at 10 Broughton Road. YORKE, Civilian, WILLIAM, Civilian War Dead. 24 May 1943. Age 67. Firewatcher. Husband of Mary Yorke, of 26 Salisbury Street. Died at Regent Garage. JARY, Civilian, PHILIP ALAN, Civilian War Dead. 14 December 1944. Age 47. of South Shields, Co. Durham. Son of the late William V. and Mary Jary. Died at 1 Lawson Street. WHITFIELD, Civilian, EMMA, Civilian War Dead. 19 February 1944. Age 51. of 12 Birchen Close, Church Lane, Kingsbury. Daughter of William and Alice Howe, of 111 Harton House Road, Harton, South Shields, Co. Durham; wife of Samuel Robinson Chisholm Whitfield. Died at 12 Birchen Close. listening to the whistling sound getting louder and louder as the bombs dropped and then the thunderous noise at impact. And then the torment of wondering who had been hit and what sort of scene they would find at street level. For most of us, we've been very, very fortunate not to have to go through that. The list of the war dead makes very grim reading. A shocking list that no doubt is duplicated many times over in many cities of England and elsewhere. May they all rest in peace. It's stange how a list of names can vividly bring back the past. My mother (now 91), when I was young, often used to recount a story of how some of our relatives had died during the war. They lived in Harper Street, and during an air raid, the husband, who had been drinking, refused to go down to the air-raid shelter. The wife and her son sought shelter under some stairs. A bomb must have dropped very close to the house and both mother and son were killed. The wall of the house collapsed, and the whole upper floor, still attached on one side of the house, provided a ramp down which the bed, complete with sleeping husband slid down it onto the street, leaving him physically unhurt - though I imagine he would have been mentally scarred by the experience. Looking at the list of dead associated with the war, I see mother and son are listed there, killed in the raid of 10th April 1941. The events of the past suddenly brought starkly to mind. 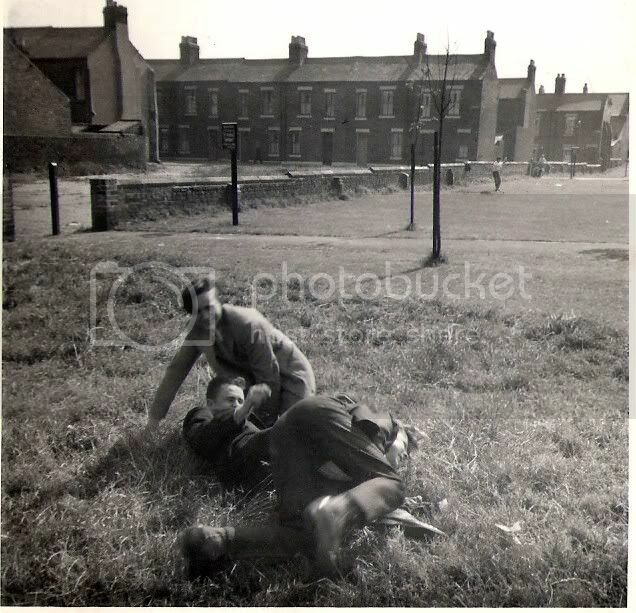 These photos show he houses at the time they were bombed, and the one with the lads indulging in horseplay shows in the background, the site in 1961 where the houses had been. Last edited by ralph on Mon May 16, 2011 11:13 pm, edited 1 time in total. and several other relatives lived there from when they were first built until they were demolished. Last edited by Mr Smith on Fri Apr 15, 2011 2:15 pm, edited 1 time in total. Merchant navy officers and crews must not have been classed as Civilian as Shields lost a lot of men. my father was at sea for all of the time of ww2 on tankers, he was one of the lucky ones who survived so many did not. the merch was recognised as an auxiliary force by king George. without them we have starved to death, we should remember them. Siam, Harper Street was bounded by Robertson Street at one end and St Stephen's Churchyard at the the other. Those from the street who lost their lives in that air raid were probably buried in St Stephen's Churchyard, very close to their homes. I know that as kids, on November 5th each year quite unaware of the tragedy that had taken place there such a few years before, we built bonfires on the site where the houses had stood. 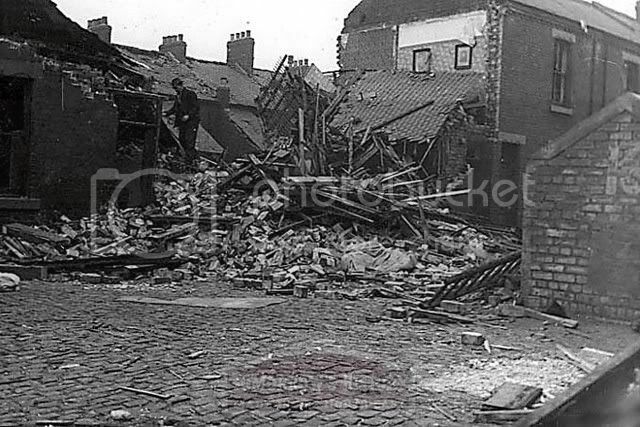 I also have photos, taken from some site on the Internet (not great quality) showing the houses just after the bombing. It really brings it all home. at someone else's house that night. Mr Smith, when I first added my contribution to this thread, you asked about Harper Street, well I have just added two photos to my original post, one showing the street soon after the bomb had dropped, and one showing how the site looked when I was about 17. That's St Stephen's Churchyard in the second photo. floating elephants, at least that's how they appeared to a young kid. Yes, thanks for that. I have been using the Word since I sent the original message(3 years ago), but not for this, only for family history. Cost for grave search is £10 per grave! !